In Broxden on the outskirts of the peaceful village of Perth, Terra Solutions- The Trenchless Experts- were contracted to install- through guided auger boring- 65m of new pipework to service a new housing development consisting of 220 homes with planning submitted for further expansion. The new sewer outfall was to be laid not only under the busy A9 highway but also the environmentally sensitive community greenway. 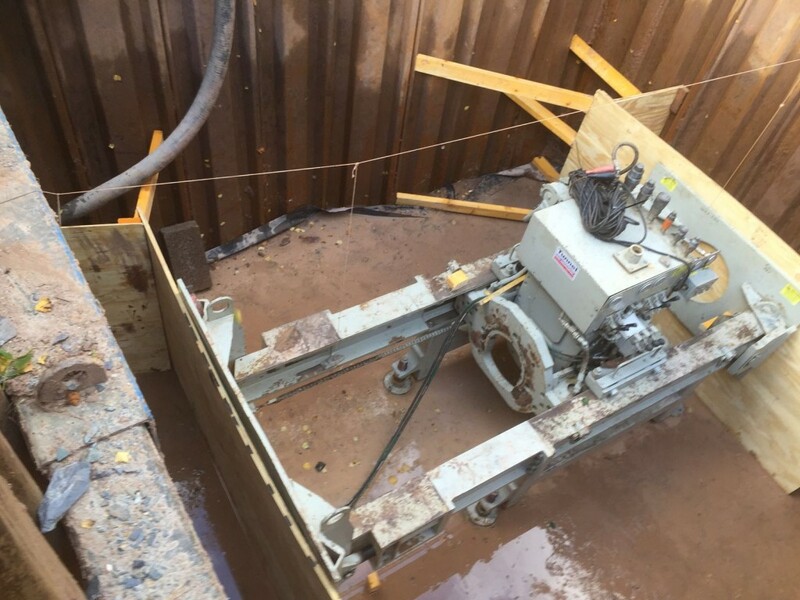 This outfall required 45m and 20m drives from a single launch pit connecting to the new housing development to the existing sewer network. Pipework was to be laid at depths in excess of 6m, which, if installed through conventional open cut techniques would have resulted in significant temporary works, traffic management, utility diversions and disruption to local residents and wildlife. The narrow access point to the drive pit which required a linear compound set up in comparison with other, more expansive sites. Harder ground was also a risk, as was discovered when further trail pits were dug. 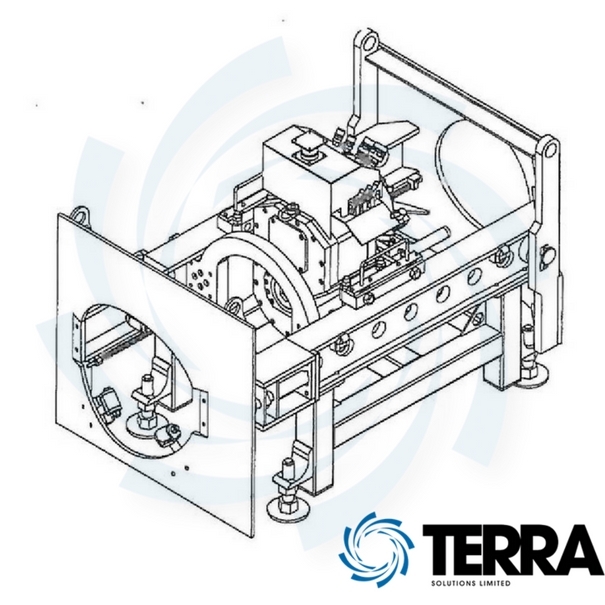 Terra Solutions mobilised the Eliminator Boring rig as a backup to minimise downtime if ground unsuitable for standard GAB was encountered. 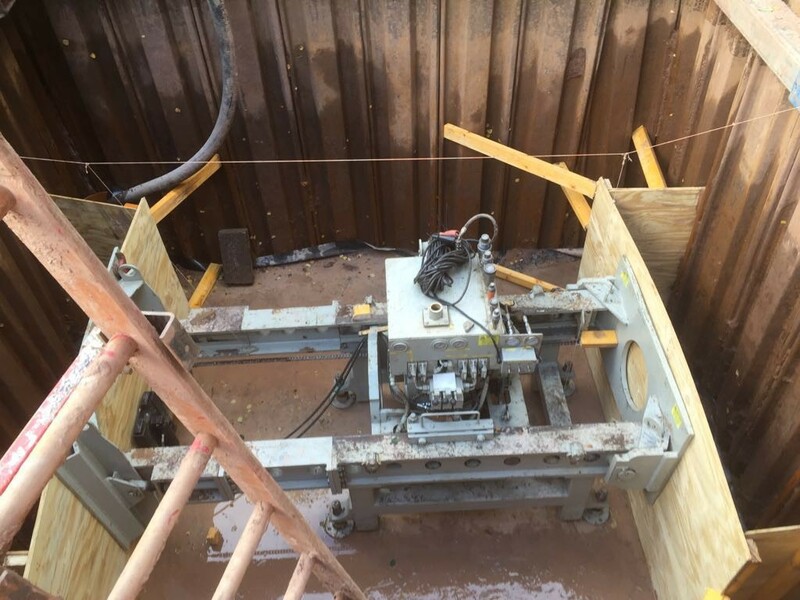 With both the launch and reception shafts for these new lengths of pipe already excavated, we were able to get straight into the setup of the guided auger boring rig, casting front and rear thrust walls capable of withstanding the expected jacking pressures. The rig and ancillary equipment necessitated a staggered arrival in several articulated lorries with 40-45 foot trailers. A 20 ton excavator was used to remove the equipment from the flatbed trailers and transport them the rest of the distance to the launch shaft. The 20 ton excavator was then used to lower the 2.75 ton jacking frame to the base of the launch shaft. 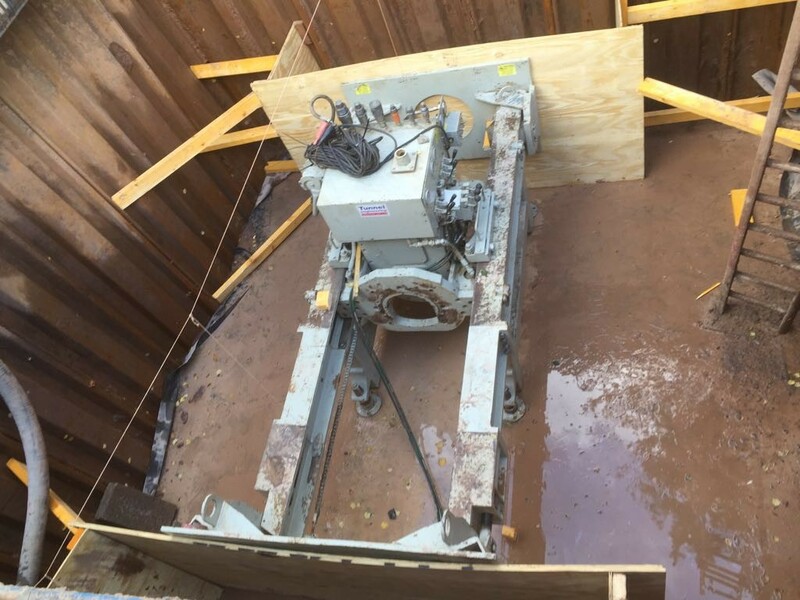 After this the 1.75 ton power pack was off loaded using chains attached to the lifting lugs and placed into position near the top of the shaft. Plant nappys and spill kits were installed around this as necessary. The jacking rig feet were adjusted so that the levels were set perfectly and the theodolite setup was carried out at this point, ensuring the accuracy of the drive both to level and alignment. The hoses, for both the hydraulics and for the water necessary in the machine were routed on top of the augerbore controls and tested to ensure all gauges were working correctly. 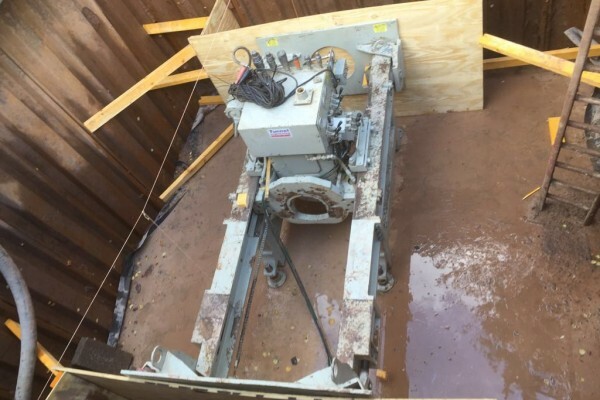 It was at this point in the job that the drive was attempted using traditional guided auger boring, making use of the pilot rod system to control the line and level. 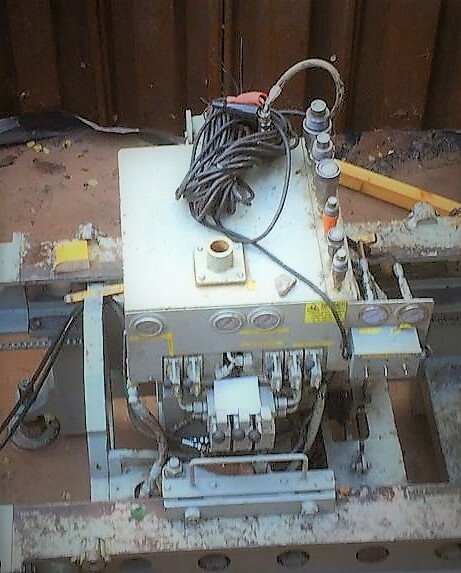 Very quickly it became apparent that the stiff clay was just within the operating parameters of the rig and thankfully the eliminator would not be required. 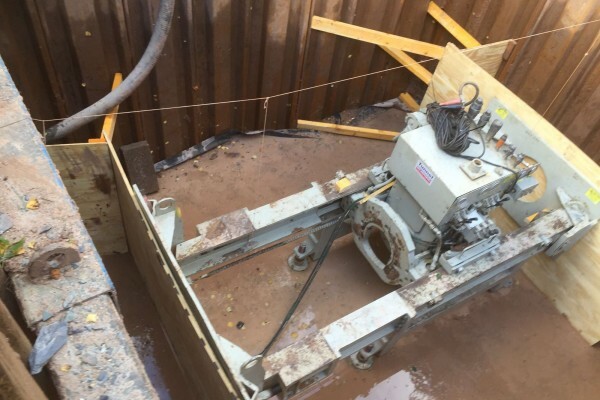 With the Eliminator attachment on site, Terra Solutions could have reacted quickly to any change in ground conditions, but thankfully this was unnecessary, maximising our efficiency on this project. 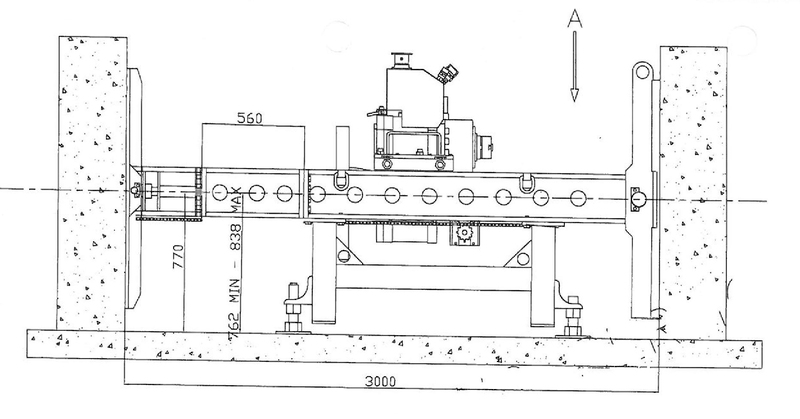 Once the pilot rods reached the reception pit, boring could commence with each 1m long casing making its way through the earth, following the line set by the pilot rods. While in motion, casings and augers were continually added until they reached the reception shaft- where an opening had been excavated- to allow retrieval from the shaft and removal by way of the attending 5T excavator. At this point in the project it was time to install the new 300mmø vitrified clay pipework. The first step was to connect a pipe thrust adapter to our rig and secure it in place. 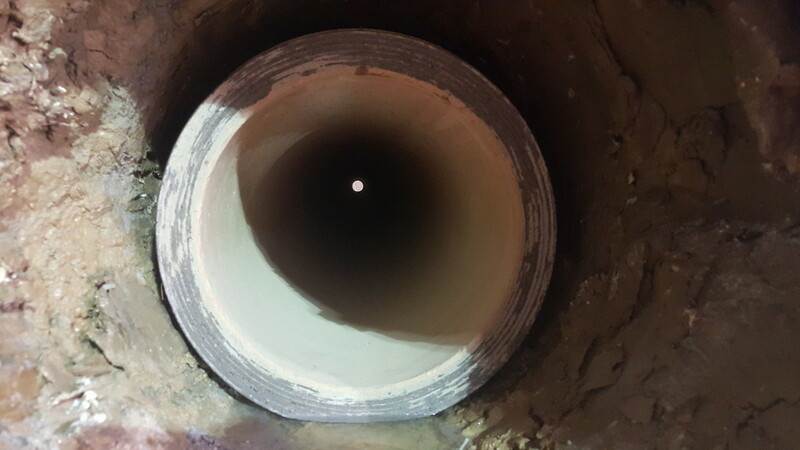 With a suitable cushion in place (made of wood so as not to damage the pipe) the product pipe was carefully aligned and pushed into the bore. As the sections of pipe were added from the launch shaft, the casings were ejected into the reception shaft and removed by the excavator. The rig was then turned around, reset and a second drive then commenced using the same technique across the busy A9 highway. Both drives were completed successfully with a high degree of accuracy and within the tolerances required under the specification. 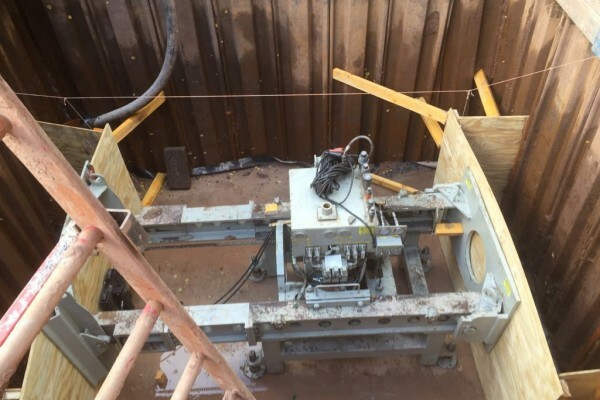 Terra Solutions were able to install the new pipework successfully using the Guided Auger Boring method, minimising disruption to the A9 highway and safeguarding the environmentally sensitive greenway. Find our other Guided Auger Boring projects here.